PDSA senior vet Sean Wensley says: Thankfully, most pet owners are aware of the problems caused by fleas - parasites that bite animals and humans causing skin inflammation which is itchy and uncomfortable. Contrary to popular belief these unwanted visitors aren't just a seasonal issue, and they aren't just unpleasant; they are potentially dangerous - particularly for small kittens. Young kittens who suffer an infestation of fleas are at risk of developing anaemia, a potentially fatal condition caused by the significant blood loss which can develop as a result of numerous flea bites. Additionally, if ingested during grooming, fleas can transmit tapeworms; parasites which, in large numbers, can cause weight loss. It is therefore vital that cat owners know how to treat their young pets to protect them from these blood-sucking parasites. Prevention is always better than cure so it helps to get into the habit of treating your cat regularly while they are young. This should begin from around eight weeks of age, though your vet will advise what is best for your kitten. Flea treatments come in the form of tablets, powders, collars, sprays and spot-ons. It is important that you use a product which is both safe and effective, and your vet is the best person to give advice tailored for you and your pet. Flea treatments intended for dogs should never be used on cats and kittens as this can result in fatal poisoning. 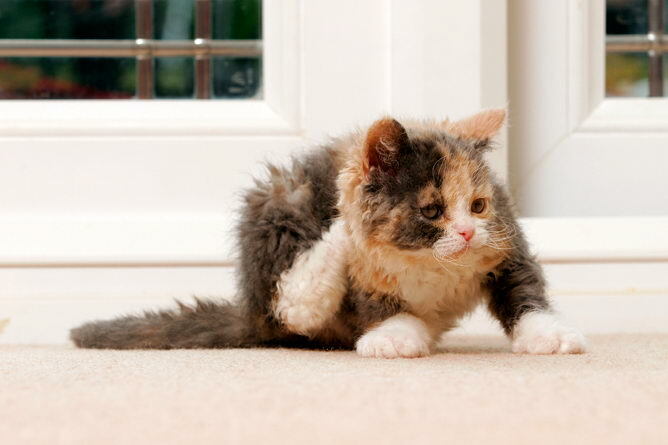 Even with preventive treatment, owners should regularly check their kitten for signs of fleas. These include fur loss, inflamed (reddened) skin, and scratching, biting or licking more than normal. A kitten showing any of these signs needs to be taken to a vet immediately. Some cats are allergic to flea bites and these pets can become extremely itchy if bitten by just one flea. As well as treating all pets in the house you will also need to treat your home, as flea eggs and larvae are found in carpets, rugs and pet beds. A special spray should be used for the living environment, all pet bedding should be washed and regular vacuuming will also help keep fleas at bay. By regularly using flea treatments and recognising the signs of any problems, your kitten can enjoy a comfortable, flea-free upbringing.